HortiBot is an autonomous plant care robot project coordinated by Aarhus University, Institute of Agricultural Engineering, Research Centre Bygholm. 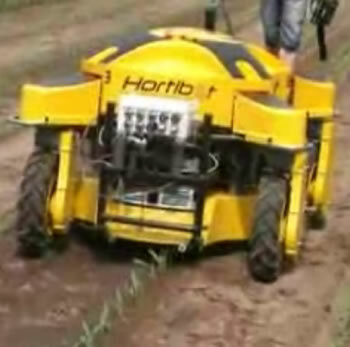 HortiBot provides precision weeding, agriculture robotics and machinery management. The HortiBot can autonomously pass over visible rows in several set areas; it uses Eco-Dan commercial row-detection software with GPS. HortiBot can recognize 25 different kinds of weeds, eliminating it with its attachments. 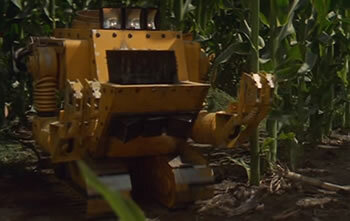 It is hoped that herbicide use can be reduced by as much as 75 percent, making HortiBot an eco-friendly robot as well. Somewhat ominously, it numbers among its weed-fighting attachments a small flamethrower and taser for burning and shocking weeds. What if a HortiBot goes out of control? I'm thinking you'll want to call Tom Selleck and the rest of the runaway robot squad from Runaway, the excellent 1984 movie written and directed by Michael Crichton. Just listen to this futuristic dialog, which could be happening any day now once HortiBot gets into using those extra attachments. Read more about the agricultural robot pest controller robot from Runaway, watch this instructive HortiBot video, check out the HortiBot website. Via Roland.